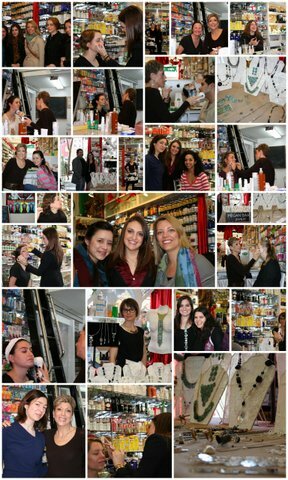 This past Saturday Thompson Alchemists had the most wonderful event ever! Esther from NUXE was on facials while Ashley from La Bella Donna was doing make-up. What a perfect marriage! As per usual, this event was full of high energy, great music and awesome food. We had so many people coming in and asking for facials that it was actually the first time I saw Esther chugging expressos to keep her energy up instead of her usual calming camomile tea. Jewelry designer Megan Isaacs was also at Thompson Alchemists the same day displaying her gorgeous collection, The Thompson Staffers all loved wearing her spectacular pieces as they were helping people with their facials and makeovers. PS – Congrats to Ann for winning the raffle — we hope you love your NUXE Tonific gift set! Check out our Facebook photo album for more awesome photos!